A Kotobukiya Japanese import. When Sector 2814's previous Lantern Abin Sur crashed on Earth, his ring sought a worthy successor and found test pilot Hal Jordan. The cocky Justice Leaguer stands with his feet apart and arms at his sides, with his right fist raised and ready to unleash his ring's energy. Coming hot on the heels of Superman is fellow Leaguer and Earth's very first member from the intergalactic police force, GREEN LANTERN. Kotobukiya's line of DC Comics"New 52"Art FX+ Statues continues, capturing the new looks and costumes of heroes in the Justice League. 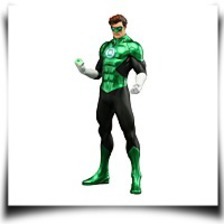 Green Lantern stands nearly 7 ½"tall (inside the Art FX+ 1/10th scale) and was sculpted by master artist Atelier Bamboo. Following Superman's lead, Green Lantern stands inside a heroic pose that's perfect for a lineup of Earth's most powerful protectors. Brash and fearless, the Emerald Warrior uses his power ring to fly and create solid light constructs of whatever he can imagine. Jordan's green mask is perfect, as is his wind-blown brown hair. Magnets in his feet make him perfectly stable on his included display base, and he'll appear perfect on your shelf subsequent to the rest from the Justice League. Kotobukiya's excellent craftsmanship may be seen inside the intricate details of Green Lantern's ring-generated New 52-style suit such as the shoulder pad-like armor and of course the logo on his chest.